Today we are interviewing Audrey Burke-Moore, author of the adult fiction novel The Choice: Weighted Letters. I have been writing for as long as I can remember. Writing is a very beautiful talent, and I am honored to have the passion of the craft. I am an avid poetry writer as well and I try to include a bit of creative arts such as poetry or songs that are written for the book in every book I write. 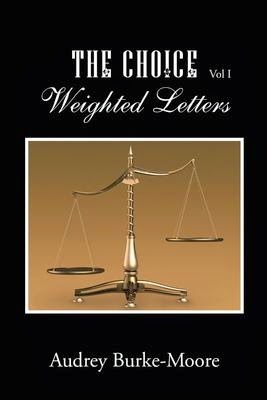 Describe the plot of The Choice: Weighted Letters in a few sentences. Keith, Chery, Austyn and Kayla of The Choice face what could be a life altering situation. Both stories pose the question to the reader “What would you do if?”. Experience the love felt as children grow into a love that could kill as adults. Take a journey with fate and chance to see which one wins. The reader that loves a true love story with a twist. The reader can place themselves in every character’s position to see how they would react if placed in their shoes. What inspired you to write stories about the power of love? I feel love is the most powerful element we have in life. Love gives you an often indescribable feeling. I love it love wins, but sometimes in life, it doesn’t. Tell us about the relationship between Cheryl and Keith. Keith and Cheryl met as children, but they had a heavy gravitational pull towards each other. You can only deny your feelings for someone for a short forever until the feelings you’re hiding resurfaces. Did you draw upon your own relationship experience when writing your book? Sometimes, but I like to pick little pieces from my past and mix it with the feelings felt in my present to create a story. One of my favorite authors was Maya Angelou. I loved her books and her poetry. How do you think you've evolved as a writer since when you first started? I believe I have grown in my writing quite a bit since first publishing my work. Are there any aspects (e.g. character building, world building) of your writing that you've been practicing? Yes. I am from the south and most of my characters are based in or surround the south. I have been experimenting with creating characters from all parts of the US and even including some from other countries. What are your goals as a writer for the next ten years? Over the next ten years, I would love to have about nine or ten books written under the Choice Series. I love to write and create stories. I also have a passion to help kids find their creative side especially when it comes down to bullying at schools and on social media. Is there any part of writing you don't like? I love the whole adventure writing can take you on. Have you ever had writer's block? Yes! Mostly when I am excessively tired. Do you write with a computer, typewriter, or pen and paper? I use a computer because it is easiest for me when I edit and submit my manuscript to my publisher. I am currently writing my next Choice Series book called the Transient: Phobias. I love conversing with the readers. At times, I will leave a story open at the end to allow the reader to suggest a new beginning to my end (a continuation of the story just read). That means, the readers would predict what should happen next. “What’s wrong Keith?” she asked. I was at a loss for words, in disbelief at the way things were playing out. I thought to myself, she is leaving for college tomorrow and she decides to do this now! I wanted to grab her and tell her how much I…I. “Keith, kiss me” she said. “Cheryl, why…are you playing with me?” She came close to me, and we stood face to face, she told me, that after all these years, that if I didn’t have feelings for her, then she would graciously walk away. “Seven years Cheryl, for seven years I have watched you grow from that frumpy little girl, to this beautiful woman that stands in front of me. You are a constant thought in my mind, but I am not willing to risk this friendship. It takes a strong person to resist someone he loves.” “Keith, you love me?” asked Cheryl. I looked at her and finally admitted my true feelings for her.